Summary and Definition: The Pawnee tribe, also known as the Pani, were a brave, formidable people and famous as farmers and hunters who engaged in fierce and violent combats with neighboring tribes. The names of the most famous chiefs of the Pawnee tribe included Sharitarish (Long Hair), Tarecawawaho, Man Chief and Chief Crooked Hand. What was the lifestyle and culture of the Pawnee tribe? The Pawnee tribe were a fierce people who intimidate their enemies by their liberal use of war paint and tattoos. In Pawnee mythology the Creator god, Tirawa who was associated with the sun, was believed to have taught the Pawnee people the art of tattooing. The Pawnee tribe were semi-nomadic hunters and farmers and particularly noted for their interest in astronomy. Unlike most of the Native Indians of the Great Plains, they lived in earth lodges and farmed for most of the year. However, they adopted the lifestyle of hunters during the time of the buffalo hunt, when their lifestyle became nomadic and they lived in tepees. In 1803, their principal village was on the south side of the Platte where they cultivated their lands and raised crops of corn, beans, squashes, sunflowers and pumpkins. The system of using sign language was developed to facilitate communication between all of the different tribes who inhabited the Great Plains and the Pawnee tribe were described as "the wolves." What were the rituals and ceremonies of the Pawnee tribe? The rituals and ceremonies of the Pawnee tribe and many other Plains Native Indians, included the Sweat Lodge ceremony, the Vision Quest and the Sun Dance Ceremony. The sacred, ceremonial pipe (called a Calumet), was ritually filled with tobacco was passed among participants at all sacred ceremonies of the Pawnee. The Pawnee tribe, unlike any other Great Plains tribes, also had a ceremony in which human beings were sacrificed. The Pawnee tribe, unlike any other Plains tribes, practised human sacrifice. A single captive was selected for human sacrifice to their creator god Tirawa and to the morning star. When captives of war were taken, all but one were adopted into the Pawnee tribe. This single captive was selected for human sacrifice to the morning star and their creator god Tirawa that he might give good crops to the Pawnee people. The captive was selected for his strength and beauty, kept by himself, fed on the best food and treated well. The Pawnee tribe danced and feasted for four days prior to the sacrifice. On the day of the sacrifice the captive was tied to a wooden framework on poles. A fire was built below, and the Pawnee warrior who had captured the victim shot him with an arrow. The body was then shot full of arrows by the rest of the tribe. The arrows were then removed, and the dead man's breast was opened and blood removed. All that were present during the ceremony touched the body, after which it was consumed by the fire as the people prayed to Tirawa, and put their hands in the smoke of the fire praying for success in war, good health and good crops. In 1816, Man Chief, a famous Pawnee war leader, clashed with the priests who brought to an end the practice of sacrificing a young maiden to the Morning Star. The morning star is actually the planet Venus as seen in the eastern sky around dawn. The meaning of the the Morning Star related to the past spirits and ancestors who were represented as stars. The Pawnee tribe believed that the stars signaled times to plant crops and revealed the timing of sacred ceremonies. They developed their mapping tradition by creating sky charts that were used in rituals and to teach about the constellations. The Sky chart also told the story of the creation of the universe and of the Pawnee people. All Native American Indian tribes believed that comets and meteorite showers were bad omens that foretold great disasters for their tribes. The Pawnee shamans depicted a famous event that occurred took place on the morning of November 13, 1833, which is now called the Leonid meteor shower. This amazing meteoric display was witnessed throughout North America and was referred to as the 'Year the stars fell'. On October 9, 1833 the tribe had signed the treaty at Grand Pawnee Village ceding "all land lying south of the Platte River"
Where did the Pawnee tribe live? The Pawnee are people of the Great Plains Native American cultural group. The location of their tribal homelands are shown on the map. The geography of the region in which they lived dictated the lifestyle and culture of the Pawnee tribe. What did the Pawnee tribe live in? 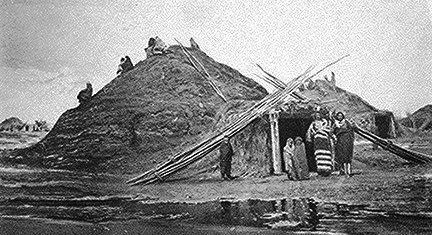 The Pawnee tribe lived in Earthen houses, also called earth lodges, which was a type of permanent home for Native Indians who lived in harsh climates without large forests. The Pawnee also used tepees as a form of temporary shelter when they went on buffalo hunts. The Pawnee Earth lodges were formed by erecting several stout posts in a circle, forked at the top, into which cross beams were laid. Long poles were laid against the cross poles and inclined from the outside toward the centre. The structure all was then covered with brush and reeds then finally with earth. A hole was left at the apex for the escape of smoke, and there was a long tunnel-like entrance at the base. The Pawnee built their earth lodges near their fields, usually on bluffs overlooking the River Platte. The biggest Pawnee village was situated on the Loupe Fork of the Platte River and accommodated about 2,500 people. Each earth lodge was capable of holding several families. The village was completely destroyed in 1876, and the Pawnee tribe were removed to the Indian Territory. 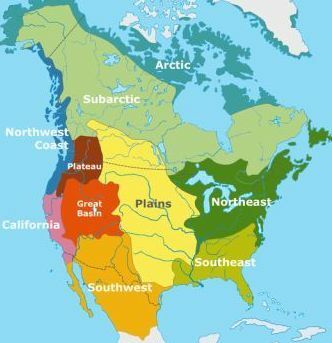 What language did the Pawnee tribe speak? The Pawnee tribe spoke in the Caddoan language. The Plains tribes had many different languages and used sign language to communicate. The name Panee or Pani means wolves, and the sign language name for the Pawnee consisted of a representation of the ears of a wolf. The reason they were called wolves is believed to derive from their use of wolf skins as camouflage in order to get near an enemy camp for stealing horses. What did the Pawnee tribe eat? The food that the Pawnee tribe ate included the crops they raised of corn, sunflower seeds, pumpkins and squash. The food from their crops was supplemented by meat, especially buffalo, that was acquired on their seasonal hunting trips. The meats also included deer, elk, bear and wild turkey. Their main food were supplemented with roots and wild vegetables such as spinach, prairie turnips and potatoes together with berries and fruits such as melon. When food was scarce the Pawnee tribe ate dried buffalo meat, called pemmican. What weapons did the Pawnee use? The weapons used by the Pawnee tribe included bows and arrows, stone ball clubs, hatchet axes, spears, lance and knives. Painted war shields were used on horseback as a means of defence. What clothes did the Pawnee men wear? 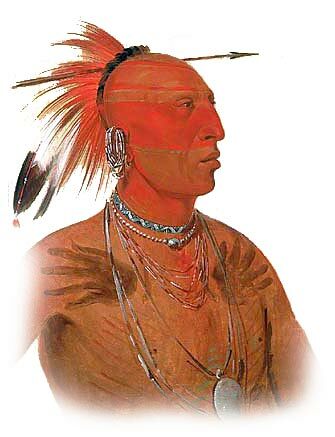 The clothes worn by by the Pawnee men consisted of breechcloths, buckskin tunics and leggings. Warm buffalo robes or cloaks or blankets were also worn to protect against the rain and the cold. They wore moccasins to cover their feet, a soft, light beige, slip-on shoe, consisting of a sole and sides made of one piece of leather. The men of the Pawnee tribe wore Roach headdresses (also called porcupine roaches) that were attached to a scalp-lock and stood straight up from the head like a tuft or crest. The roach headdresses were made of a stiff thin strip of animal hair placed over the top of the head which were held open by comb-like objects, originally carved of antler, called roach-spreaders. Roach headdresses were made from a variety of hairs including white deer tail hair, often dyed red, moose-hair, porcupine hair and black turkey beard. Sometimes feathers, arrows or shells were added as decorations. Some of the Pawnee Chiefs also wore long war bonnets.. The women of the Pawnee tribe were responsible for making the clothes worn by the people. Most garments were sewn from the soft, tanned skins of deer (buckskin) and buffalo hide. Pawnee clothing was often decorated with paint, porcupine quills or beadwork. Pawnee clothing for both men and women were adorned with ornaments, especially necklaces and earrings. What clothes did the Pawnee women wear? The type of clothes worn by the Pawnee women were knee-length dresses and leggings. The women also wore the buffalo robes to keep warm and dry. The dresses of the Pawnee women that were used for special ceremonies were intricately decorated with beads and intricate paintings. Dresses were painted with symbols that reflected their tribal identity and family values celebrating acts of courage by their men or sacrifices made for the well-being of the family and tribe. Pawnee women wore their hair long worn in two, thick braids that were often decorated with beads. The Pawnee used Pictograms on their clothes and tepees to convey a story through pictures, signs and symbols that signified and resembled the shapes of physical objects or people. The article on the Native Indian use of pictograms includes a picture of a Pawnee robe that depicts a Pawnee battle, their horses, family and symbols for the sun, stars and moon. Who were the most famous leaders and chiefs of the Pawnee tribe? The most famous leaders and chiefs of the Pawnee tribe included Man Chief, Crooked Hand, Eagle Chief, Brings Herds, Struck with a Tomahawk, Rattlesnake. The Pawnee had many enemies amongst the other Plains Native Indians including the Cheyennes, Arapahos, Delawares, Sioux, Comanches, Apaches, and the Kiowas. Pawnee History: What happened to the Pawnee tribe? The following history timeline details facts, dates and famous landmarks and battles fought by the Pawnee Nation. The timeline explains exactly what happened to the Pawnee tribe. 1833: Treaty at Grand Pawnee Village on October 9, 1833 ceded "all land lying south of the Platte River: annuity: $4,600 in goods"
For additional facts and information refer to the legend and the Pawnee Story of the Mud Pony.